hasn’t kept a number of pundits from offering suggestions on improving your likelihood of success. 1. Make one resolution only. Don’t make the mistake of trying to achieve too much. For example, it makes little sense to try to quit smoking and lose weight at the same time. This is a formula for failure. 2. Be as specific as possible. Instead of saying you want to lose weight, aim for a specific amount of weight (e.g. one pound) each week. 3. Focus on the positive aspects of your new behavior. For example, if you want to quit smoking, think about the how much better off you will be---more respiratory capacity, fresher smelling clothing, more disposable income, etc. 4. Wait for the most opportune time. If you have not planned in advance, New Year’s Day may not be the best time to begin. If so, look to a date when you will be better able to accomplish your goal. 5. 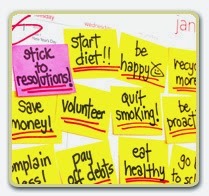 Let others know about your resolution. Family members or friends can be a great source of support or accountability in keeping your resolution. 6. Take “baby steps”. Break the goal into small, achievable steps. For example if a new job is the goal, the steps to success could include writing a resume, performing a needs analysis, talking to potential references, arranging for one interview a week, etc. 7. Write down your goals. Commit them to paper and review them periodically to see where you stand. 8. Expect setbacks. Since nobody’s perfect, you may revert to your old habits from time to time. These should be considered temporary, rather than a reason to give up on your goal. 9. Be realistic. Take time to seriously consider what you want to accomplish and don’t set the bar too high. 10. Avoid previous resolutions. This usually just leads to breaking the resolution a second time. If you do make a similar pledge, think about why you were unsuccessful and take steps to avoid a similar outcome. One could argue about the wisdom of making New Year’s resolutions at all. Too often, they end up being something that “goes in one year and out the other”. Nevertheless, positive changes in people’s lifestyle, family circumstances, or financial situation can and do occur when the commitment is there. Hopefully, some of the tips above will help you reach your goals for the New Year.